A couple of lists of birds observed or compiled by the late Bill Freedman and associates illustrate how forest harvesting can have strong effects on bird communities by their effects on successional habitats and dead wood. Notes: Uncut: (3 plots) Mature paper birch, red maple, sugar maple, yellow birch, white ash; 70 years post-fire in red spruce/hemlock/pine zone of Loucks (1972), Kings Co.
Every bird species has particular habitat requirements, and on any particular site, habitat suitable for birds of mature forest is modified or destroyed by harvesting, while opportunities are created for early successional species. 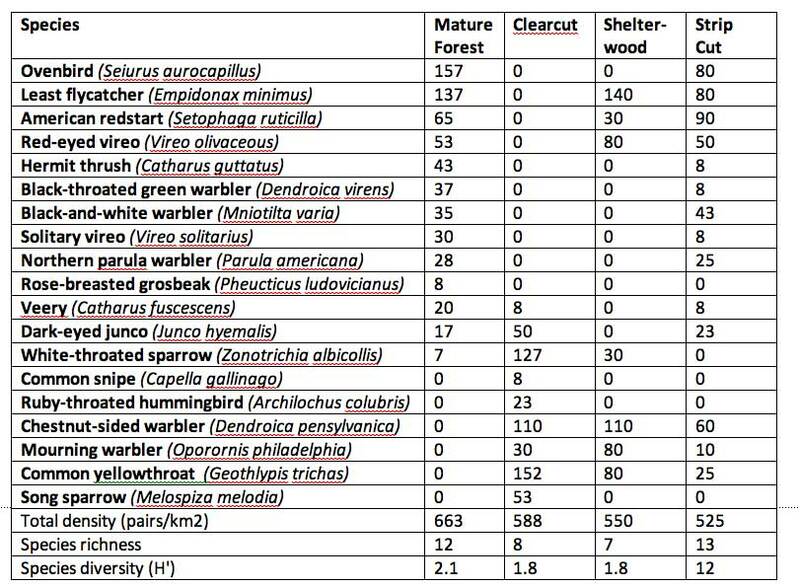 These effects can be illustrated by comparison of the breeding birds of mature hardwood stands and adjacent clearcuts in Nova Scotia [Table 1]. The uncut forest in this study was mixed maple-birch, and its bird community was dominated by ovenbird (Seiurus aurocapillus), least flycatcher (Empidionax minimus), red-eyed vireo (Vireo olivaceous), black-throated green warbler (Dendroica virens), and hermit thrush (Cattzarus guttatus). The total abundance of birds among the three mature-forest stands averaged 663 pairslkm2, while species richness averaged 12 (range 9-16) and Shannon-Weiner diversity 2.1 (range 1.8-2.5). The bird density of three 3- to 5-year-old clearcuts averaged somewhat smaller (588 pairs/km2; range 435-745 pairs/km2) than the adjacent forest stands, as did species richness (8; range 7-10) and diversity (1.8; range 1.7-2.0). 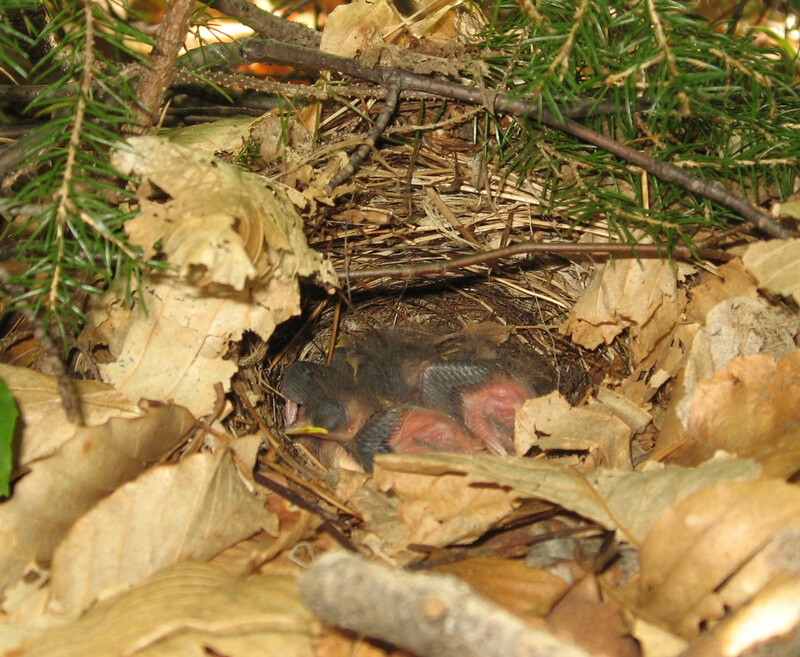 More important, however, the bird species breeding on the clearcuts were almost completely different from those of the mature forest, and were dominated by chestnut-sided warbler (Dendroicea pensylvanica), common yellowthroat (Geothlypis trichas), whitethroated sparrow (Zonotrichia albicollis), and dark-eyed junco (Junco hyemalis). In this case, the differences in avian community parameters are not substantial, but there are large changes in species composition. Freedman et al. (1981) also examined stands that had been harvested by shelterwood (ca. 50% basal area removal) and strip-cut (ca. one half of the census plots was clear-cut in 300 m long, 30 m wide strips) systems. The shelterwood and strip-cut harvesting produces habitats intermediate in structure to uncut forest and clearcuts, and these sites were correspondingly occupied by a mixture of bird species typical of either clearcuts or mature stands, while total bird density, species richness, and species diversity were not substantially different from the mature forest. Table 2: Birds of the Maritime Provinces that use snags or dead trees on the forest floor as nesting habitat. Adapted from Freedman et al. 1994. (Click on table image for a larger version.) PRI: primary hole excavator; SEC: uses abandoned cavity of primary excavator; NAT: uses cavity created naturally; BARK: nests under loose bark; DOWN, nests in or under dead trees on the forest floor; PLAT: constructs a platform nest on a snag or on a broken-topped, living tree. Species dependent on deadwood and cavities An important habitat feature that influences the presence and success of certain species of wildlife, is the density of dead trees in the forest, occurring either as standing snags or as logs lying on the forest floor These habitat features are especially important to certain species of birds, and are used for nesting in excavated and (or) natural cavities, as foraging substrate, and as perches for hunting, resting, feeding, and singing. Scott et al. (1980) estimated that 30-45% of the breeding bird species of conifer and aspen forests of the northwestern United States are cavity nesters, requiring snags as a necessary habitat feature. 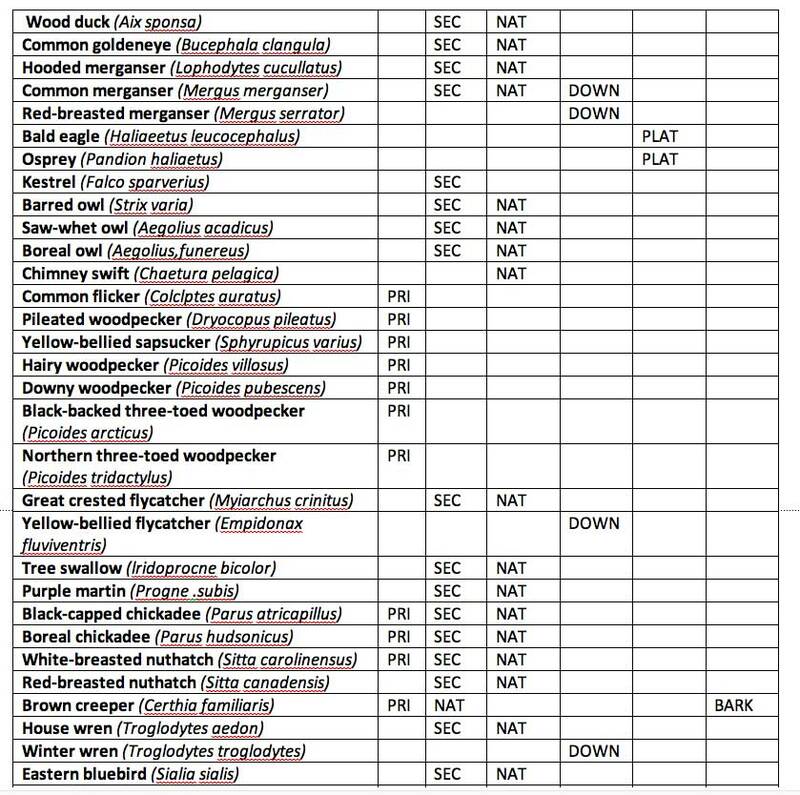 A list of birds that use snags or logs as nesting habitat in eastern Canada is provided in Table 8. 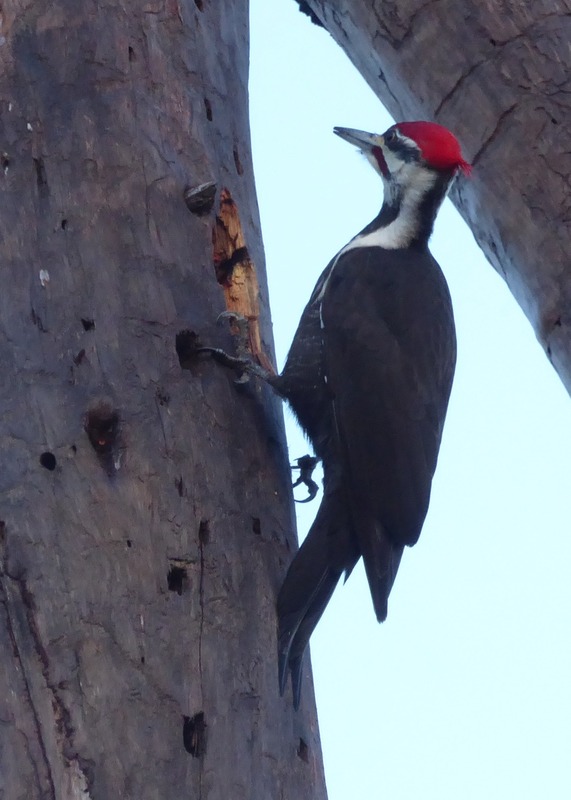 These species include primary excavators such as woodpeckers, secondary cavity users, and species that use natural cavities. Clearly, snag management can be an important variable that influences the effects of forest harvesting on birds. Maintenance of the habitat of cavity-dependent birds has become an important consideration in the integrated management of many forests in North America. Freedman, B. et al. 1994. Forestry practices and biodiversity, with particular reference to the Maritime Provinces of eastern Canada. Environmental Reviews, 1994, 2(1): 33-77. By Daralyn McCurdy & Bruce Stewart. 2005 NSDNR FOR 2005-1 No. 76 June 2005. Very few snags remained after harvesting. CWD increases (but would not do so with whole-tree harvesting); these were figures for harvests of stands ranging in age from 42 – 97 years. Table 2 gives figures for dead wood prior to harvesting. Figures and tables provide data on average volume of deadwood (coarse woody debris and snag) by forest group for mature stands.